What is “Selectivity” and how is it used in the management of Columbia River Fisheries? The Endangered Species Act (ESA) is the major limiting factor in structuring Columbia River fishing seasons. Of the salmon and steelhead stocks originating in the Columbia River Basin, 13 have been listed as threatened or endangered under the ESA since 1991. ESA-listed fish comprise a portion of nearly every run of salmon/steelhead in the river, and almost all fisheries occurring in the Columbia River encounter at least some ESA-listed fish. Fisheries must be carefully structured to minimize impacts on ESA-listed fish, while maximizing fishery opportunities for healthier stocks and hatchery fish. Federal ESA impact limitations are developed and mandated to the states by NOAA Fisheries. The ESA listings require the states to develop fisheries that are able to comply with these limitations, and the allowable fishery impact rates specified by NOAA Fisheries cannot be exceeded. In spring Chinook fisheries, mark-selective (adipose fin-clip only) rules are used in recreational and commercial fisheries in order to minimize impacts on wild fish while allowing access to abundant hatchery stocks. Stocks of hatchery fall Chinook are only now becoming fin-clipped on a large-scale basis that may allow for mark-selective fisheries in future years. Fall Chinook fisheries are not mark-selective at this time. During non-mark-selective fisheries, ESA impacts may accrue at higher rates, and the DFWs utilize time, area, and gear restrictions, as well as daily bag limits, to reduce these impacts and extend opportunities for non-ESA-listed fish. Both Oregon and Washington have state statutes directing the fish and wildlife agencies to provide for both recreational and commercial harvest opportunity. Oregon State Law (ORS 506.109) directs the Fish and Wildlife Commission to provide for recreational and commercial harvest opportunity and to "manage food fish for optimum economic, commercial, recreational, and aesthetic benefits". Drift nets are currently the only legal harvest gear for commercial salmon fisheries in the Columbia River. However, ODFW and WDFW have the authority to regulate gear requirements, hours of fishing, and times and areas open for harvest, and use all of these to manage the fisheries. The question of whether commercial fisheries should continue on the Columbia River is primarily a social, rather than a biological, issue. Commercial and recreational fisheries are both managed to ensure that the incidental mortality of wild fish resulting from their handling in fisheries falls within limits established to ensure their survival and recovery. The primary limiting factor in structuring fisheries is ensuring compliance with conservation and recovery plans established under the Endangered Species Act (see ESA FAQ). Under the ESA, fisheries are limited to “allowable impacts” on various stocks and species of listed fish. These allowable impacts establish the limits that are imposed on fisheries, in terms of total take of fish. The states must also ensure that sharing agreements with the Columbia River Treaty tribes are upheld. Known as the U.S. vs. Oregon agreement, the latest version of this sharing agreement is in effect for 2008-2017, and specifies the total allowable shares of available ESA impacts that are to be allotted to Treaty and non-Treaty fisheries at various run sizes. Season planning varies by species and fishery. Fish stocks such as fall Chinook and coho that comprise major portions of ocean fisheries are subject to negotiations during annual meetings establishing ocean fisheries through the Pacific Fisheries Management Council. This process establishes how the allowable take of listed components of these runs will be shared between ocean and Columbia River fisheries. These negotiations take place at annual PFMC meetings and through the “North of Falcon” process. (see WDFW NoF website). During this process, PFMC council members consider the needs of the various fisheries and attempt to balance the available fish impacts across all user groups. 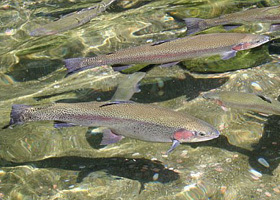 For steelhead, spring Chinook, and summer Chinook, which are primarily caught in freshwater fisheries, management of the fisheries is largely determined by the states of Oregon and Washington. In the case of spring and summer Chinook, allocation of available impacts to recreational and commercial fisheries is decided by the state Fish and Wildlife Commissions. Steelhead are not legal for harvest in Columbia River commercial fisheries, and except for limited incidental mortality in commercial salmon fisheries, are allocated entirely to recreational fisheries. Once available limits for each fishery are established, staffs from the state DFWs examine the expected return of each fish stock, and use past fishery information to project expected season structures for fisheries that will meet the conservation objectives already established. Commercial fisheries are managed by the Columbia River Compact, which is a Congressionally-approved agreement between Oregon and Washington dating from 1918. The Columbia River Compact is the decision-making body that governs commercial fisheries in concurrent waters of the Columbia and consists of the Directors, or their delegates, of the Oregon and Washington Departments of Fish and Wildlife. The State of Idaho, Columbia River Treaty Tribes, numerous federal agencies, and the Shoshone-Bannock Tribe of Idaho are also represented on the Compact, but do not have decision making responsibilities for setting commercial fisheries under the Congressional agreement. Recreational fisheries in concurrent waters are managed under Joint State action by the two states, and while there is not an overriding agreement requiring cooperative action, as in the case of the Compact, the states generally seek agreement on recreational fisheries issues and establish concurrent season structures in the Columbia River. Fisheries occurring within state waters (tributaries, etc.) are governed solely by the home state. Joint State decisions are generally discussed in a public forum, or Joint State Hearing, which may occur before or following a Columbia River Compact; however, the two processes are distinct from one another. Both Columbia River Compact and Joint State Hearing meetings are open public meetings that allow public testimony during the meeting. One of the major drivers in structuring fisheries is the projected run size of the stocks being fished. The DFWs utilize preseason estimates of projected return, but often update these estimates based on in-season information, such as dam counts. These updates can result in increased estimates of run size, which may result in additional fishing opportunity, or can result in decreased estimates of run size, which may lead to emergency closures. Due to the Endangered Species Act, fisheries in Oregon are generally constrained more by how many wild fish will be killed rather than how many fish are available overall. Increased production of hatchery fish may not lead to increased fishing opportunities, simply because wild fish are also encountered in fisheries, and impacts to those stocks must be limited in order to recover the populations. In most cases, ESA limitations would continue to constrain fishing opportunities, despite larger returns from increased production of hatchery fish. Oregon State Law (ORS 506.109) directs the Fish and Wildlife Commission to provide for recreational and commercial harvest opportunity and to "manage food fish for optimum economic, commercial, recreational, and aesthetic benefits. Recreational and commercial fisheries in the Columbia River are managed under fishery-specific quotas in most seasons. This means that recreational fisheries have one quota andcommercial fisheries have a separate quota. These individual quotas can also be even more specific, for instance, there may be separate sub-quotas for the Buoy 10 recreational fishery and the mainstem Columbia River recreational fishery, or for commercial salmon fisheries in different areas of the river. Separate quotas are intended to provide opportunity in different parts of the river and help ensure that one fishery is not closed due to higher than expected catches in another. Because of these individual quotas and sub-quotas, it is common for one fishery (commercial or recreational) to continue after others have been closed. In most cases, fisheries are not closed on the basis of too few fish available overall, but rather due to the specific quota being met (see Quotas FAQ), or ESA limitations being reached (see ESA FAQ). In order to maximize fishery opportunities while meeting ESA objectives (see ESA FAQ), fisheries in the Columbia River are managed under fishery-specific quotas in most seasons. In most cases, fisheries are not closed on the basis of too few fish available overall, but rather due to the quota established to meet ESA objectives being met. Most fisheries are managed on the preseason forecast until an in-season run update is available. Fishery managers pay close attention to passage at the dams and update the run as soon as possible. Until passage is sufficient to determine if the strength of the run is greater than forecast, fisheries are generally managed based on the estimated number of fish available from preseason forecasts. If that quota has already been met, then the fishery will remain closed until an in-season run update is available. 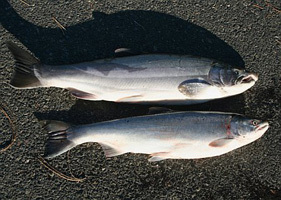 Columbia River fisheries are usually managed on quotas (see Quotas FAQ). These quotas are derived based on impact limits to ESA-listed species (see ESA FAQ). Most of these limits are based on a percentage of the listed fish that can be killed or handled in a fishery. This percentage is calculated by dividing estimates of the total kill or handle by the estimated run size. These limits are then subdivided among various sport and commercial fisheries. Prior to fishing seasons, the DFWs craft fisheries based on expected returns of various fish stocks and expected catch rates of those stocks by each fishery. As the fishing seasons progress, more information on the abundance of fish stocks becomes available. Sometimes this update results in an increase in the estimated abundance of listed stocks, which can lead to increased fishing opportunities. Other times this update results in a reduction to the estimated abundance of listed stocks. When this happens, planned or ongoing fisheries may require emergency action in order to remain within the ESA limits set aside for each fishery. In extreme cases, immediate action can be required, sometimes with short notice of only 1-2 days. Because fisheries are highly constrained, even small changes in catch or run size estimates can result in emergency action being required. The DFWs try to avoid extremely short notice closures, but are forced to take immediate action if ESA limits are reached. The use of in-season action allows the DFWs to maximize opportunities for non-ESA-listed and healthy stocks of fish. However, it also tends to create more volatility in the structure of fishing seasons. More stable fishing seasons might be possible if the DFWs planned sport fishing seasons more conservatively; however, this would also lead to reduced fishing opportunity overall (shorter seasons and/or lower catch quotas). In-season management allows the DFWs to both conserve listed fish stocks and manage fisheries for optimum fishing opportunities, but requires flexibility in how fisheries are operated. 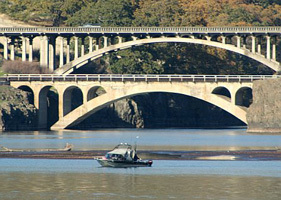 Fish stocks and therefore fishing seasons in the Columbia River are highly dynamic. Run predictions are based on past return information, and are often not highly precise. To model the fisheries, the DFWs typically use past fishery information to predict fishery performance and plan fishery structures months before the fisheries begin, in order to provide anglers with time to plan their fishing. However, planning this far ahead can often lead to missed estimates or forecast errors. In order to account for these errors, in-season management is required to conduct the fisheries while meeting conservation goals. Coupled with constraining ESA limits on key fish stocks, the dynamic nature of these fisheries makes long-term planning difficult and puts a high importance on the use of in-season management in order to maximize the returns to fisheries. In lieu of in-season management, and the ability to adjust fisheries on short notice (either to extend or reduce them), the DFWs would have to be much more conservative in planning in order to ensure that conservation goals are met. This would likely result in fewer emergency closures and more predictable season structures, but this stability would come at the expense of maximized fishing opportunities when runs were stronger than expected, and would lead to shorter seasons and lower overall catches. 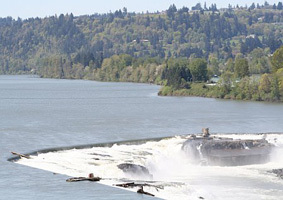 Fish counts at Willamette Falls are made from video recordings of passage through the viewing window. The video recorder captures fish passing the window 24 hours per day and seven days per week year round. Counts of fish in the recordings however must still be made manually. ODFW employs one person to maintain the ladder window, counting equipment, and to review the recordings and count fish. When this person is sick or on vacation, counts may be delayed until they return. During peak abundance periods, the recordings can take longer to analyze due to volume of fish passing the camera. This increased analysis time can result in delays in posting the most recent counts. Columbia River Fisheries Management (pdf) - Estimating Effort, Catch, and ESA Impacts in Recreational Fisheries.